Sat-feed chatter from low-orb bio-cols call it, the bruise. A swirling endless hurricane-vortex of black-crowed tox sleet and electro-static chaos. To deep-space cargo lines passing the outer belts, the distant orb is named simply, the dead eye. 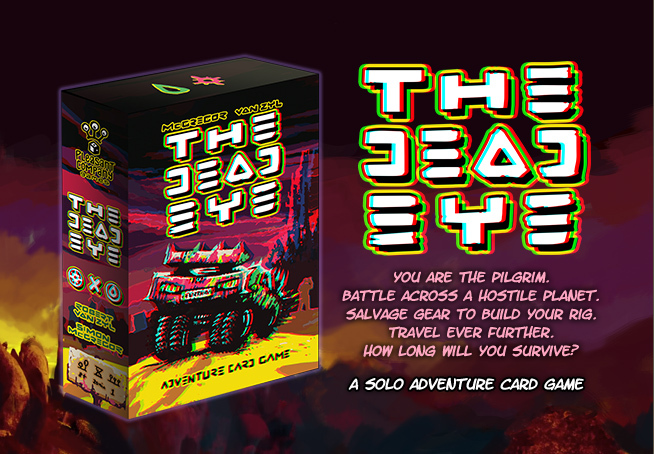 The Dead Eye is a solo card game of cosmic survival adventure. The player assumes the role of the pilgrim, battling across an inhospitable world, salvaging parts, to reach ever further to the heart of a perilous storm. The game includes 54 unique cards, player mat, rulebook and anaglyph 3D glasses. PRE-ORDER – KICKSTARTER – Q1 2019. LAUNCH – GEN CON 19 INDIANAPOLIS – Q3 2019.